We've got all of the film camera locations you can dance in front of for this season 4 battle pass challenge! It's time to dance for the camera in the season 4 of the battle pass. 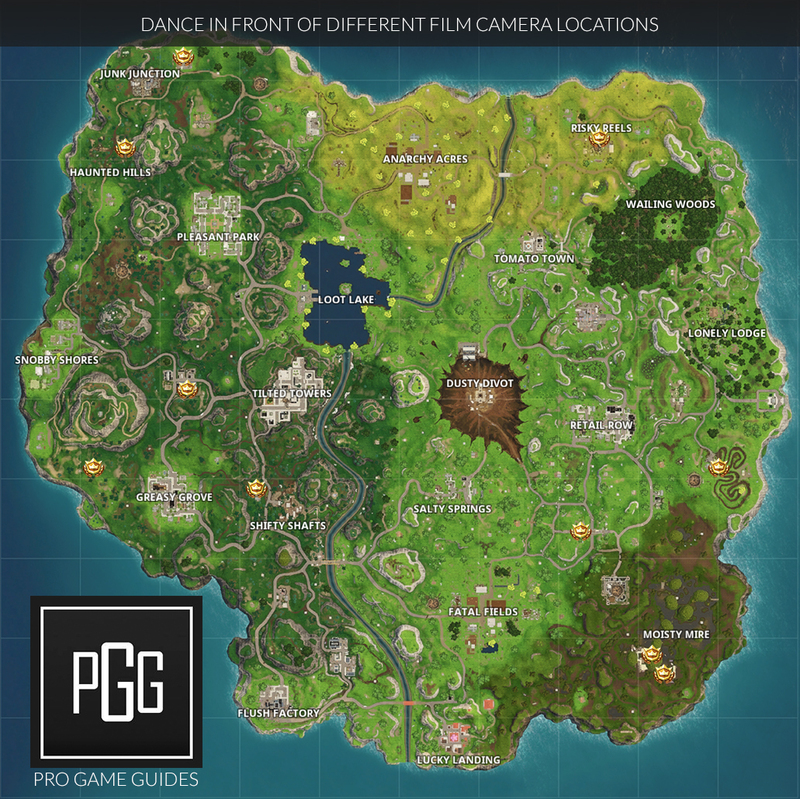 We've got all of the Fortnite film camera locations below on a convenient map! I'm also going to detail a bit where you can find each location and talk a bit about what the fastest route will be! Here's a map of the currently known film camera locations, we'll be sure to update this map if we find anymore locations. You'll need to dance in front of seven different cameras, so you'll be needing to dance quite a bit to complete this challenge. You don't need to do these all in one go, but you can hit quite a few if you land in specific areas of the map! If you want to check out more information on the rest of this week's challenges, check out our Fortnite Battle Pass Season 4 Week 2 Challenge Guide! Here's a description of the film camera locations from the map above! Moisty Mire 1 & 2: These are very close together in the new filming area that was added in the 4.0.0 patch. One is on the tracks on the ground, and one is up on the second tier area near the tracks. North West of Prison & Moisty Mire Bridge: The newly destroyed prison that is north west of Moisty Mire is near a bridge. Head there and you will find a film camera! Race Track (South of Lonely Lodge): Right at the starting area of the shopping cart race track is a camera! Risky Reels: Not surprising to find a camera here, but it's in the northern building on the first floor with the green screens. North West of Junk Junction: There's a new film set to the north west of Junk Junction that has a camera! Haunted Hills: In the big church area there's a camera on the first floor. Don't be confused by the basement area that has a coffin and sometimes a chest. It's the floor directly above that! North-ish West of Greasy Grove: Here's where the infamous dinosaur footprint is leading to many conspiracy theories. Maybe they are just filming a new Jurassic Park? Soccer Field (West of Tilted Towers): In the actual soccer field stadium area there is a camera ready to film all of the action! Shifty Shafts Streamer House: Very close and to the west of Shifty Shafts is two houses. One used to be a standard broken down house, but it has been changed into what has been dubbed as "streamer house". If you head to the basement of this house, you will find what appears to be a streaming setup and a camera to dance in front of!